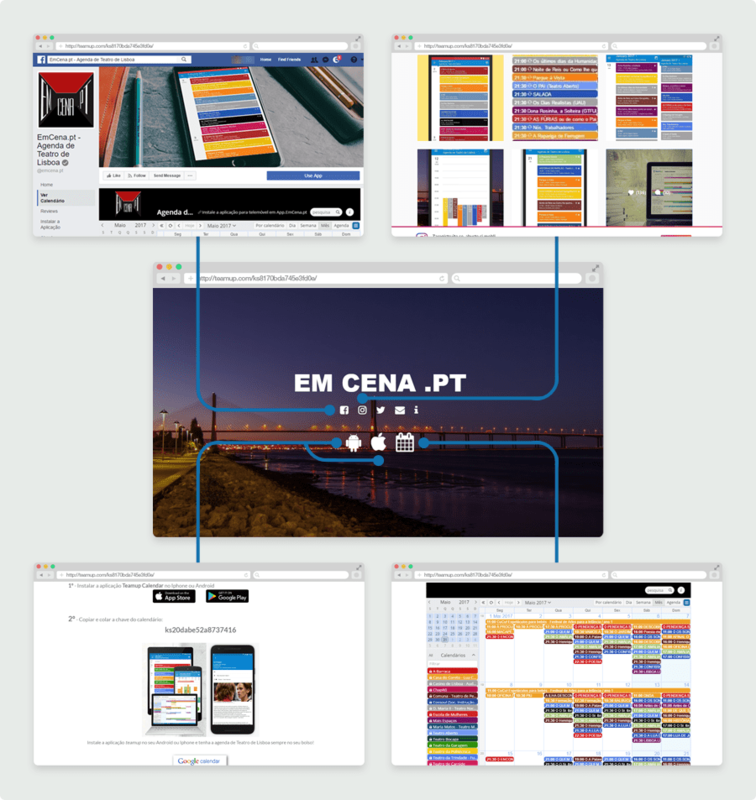 EmCena.pt is a pilot project that provides free agenda of Lisbon Theater programs. It is easily accessible on the web as well as via the iPhone and Android applications. “There was no agenda in Portugal dedicated exclusively to the Theater in Portugal”, said Fábio Salgado, who studies theatre in Lisbon University. Fábio initiated the project and is determined to bring all theaters to work on one platform. It should be “a free-to-use, ad-free, and self-posted calendar for theatre in Lisbon, Portugal”, he said. There is one dedicated sub-calendar for each theater, and each theater also gets a unique calendar link which allows them to post to their calendar directly. There is no need to email someone with a new or updated theater program, no wait for a webmaster to push the button to publish the information on the Internet. It’s real-time self-publishing. All posted information is immediately accessible to the public without delay. The site was launched in January 2017. There are about 30 theaters (independent and municipal) that put their programms in Teamup that is public to anyone through the page EmCena.pt or the application for mobile phone Teamup. It is, at this moment, an essential information point about the Portuguese Theater programs. This page can then be shared further easily via the buttons in the top right, or simply the unique page URL itself. Theaters in Lisbon gets to be listed on a professional platform for free. Minimum effort is required to publish a professional looking “online brochure” for any one specific program and make the information instantly available to the public. The easy social sharing provides a new way for program promotion without additional costs. 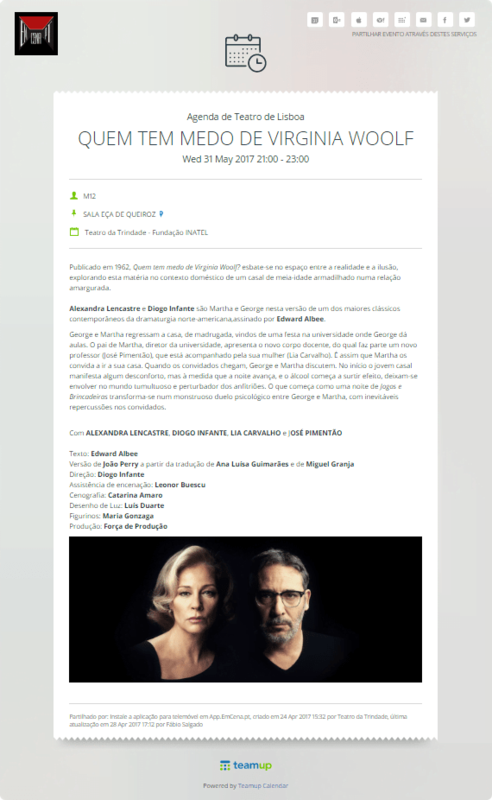 The public can access the full spectrum of the theater programs in Lisbon in one ad-free online place. It is not only informative, but also looks beautiful. It’s easy to reserve the dates on one’s personal calendar or share the program information with others. For the project team, no additional cost is required to operate the site as a non-profit project that enriches the cultural experience for the people living or visiting Lisbon. Do you want to make life easier and more fun for people you work with and those you care about? Get in touch or just start experimenting yourself.